This page is a translated version of the page Radius and the translation is 100% complete. The Radius brand is the one which is known for the highest quality SAFIS production, and is usually identified with this company. It was joined by the Astura brand, used for the second tier production. Though less known, it is the production of one of the most important Italian companies, and Radius pens, like its predecessors The King, are, at least for the production that took place in the golden age of company, of highest quality and have nothing to envy to the production of the most famous italian companies like OMAS or Aurora. With the competition due to the gradual spread of the ballpoint pen on the market, the quality of the production, especially in the last years of the company, got much worse, but after the war, the Radius has continued to produce good quality celluloid pens until the '50s, and the production of this brand is still of great interest collezionistico. Around 1934 "The King Società Anonima Torino" was renamed in "Società Anonima Fabbrica Italiana Stilografiche", because of the policies of forced Italianisation of names carried out by the fascist regime, which made it unattractive to use an English name. It is not known when the first pens Radius appeared on the market, and at the moment the only certain date is that of the trade mark registration (Reg. Gen. N. 50489) which occurred in 1934 by the new company, which is why we take this year as its starting date. A '50s Radius Extra instruction sheet. 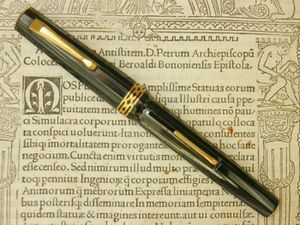 The Radius initial production was divided in two lines: the Superior for the more valuable high-end pens and more valuable, and the Extra for second tier pens sold at lower prices. The Superior line remained in production, with different stylistic and technical changes, including the implementation of Trasparente version, until the '50s, while the Extra line was decommissioned in the late '40s, replaced by other economic production, such as the Comet and the Radius 31, hooded nib models of much lower quality than its predecessors. Astura brand production was instead purely dedicated to the economical level and saw an huge variety of diffeerent models made with the most different filling systems and the most varied forms, in a sort of trial both technical and stylistic. The production is dated to the period from the 30s to mid 50s. Although clearly low-end pens, there are particularly interesting models like the versions with a special vacuum filling system, made of transparent celluloid. Astura brand production of the '30s and '40s is extremely varied, with a production oriented towards economic pens with wide distribution, made in ​​numerous variants of finishes, shapes and colors. In the '50s, with the crisis caused by the advent of disposable ballpoint pens, were produced ever cheaper and low quality models. Astura production seems to be terminated in the second half of the 50s, like the Radius one, likely due to the cessation of the activities of the parent company SAFIS, probably take out of the market by the success of the ballpoint pen. But there is no reliable documents or specific details for the cessation of activities. 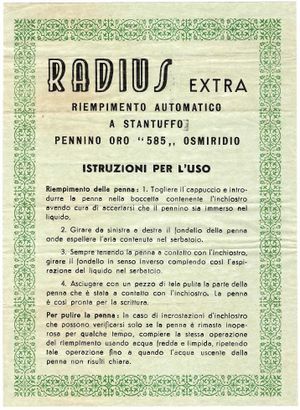 ↑ Letizia Jacopini in his book La storia della stilografica in Italia, reports the testimony of Bruno Milocani and Emilio Pionzo indicating the shift of production from The King to Radius around 1935 right for this reason. This page was last edited on 16 March 2019, at 02:23.